@Biscuits, can you vouch for them working, at least? @Biscuits, here you go . Ok. So I installed the custom portraits in the Portrait Directory. They show up properly, and I can select them. BUT... I can't switch to scrolling the small portraits. So all I can select is the 1st few small portraits in that screen. Clicking on a small portrait and scrolling still scrolls the top (medium) portraits. @RangerSG As far as I know you have to click the down arrow next to the small portraits display to scroll through them. You can't use your mouse wheel. @RangerSG You have to click on the arrows on the scroll bar, not your keyboard arrows. Yeah, that was the problem, the arrows had disappeared, so I couldn't scroll except by mouse wheel. I think it was because I had added too many custom portraits (or a few the game didn't like, perhaps). Because when I pulled them into a second directory for 'storage' the arrows returned. So I'll just move the ones I need when I play out of storage. 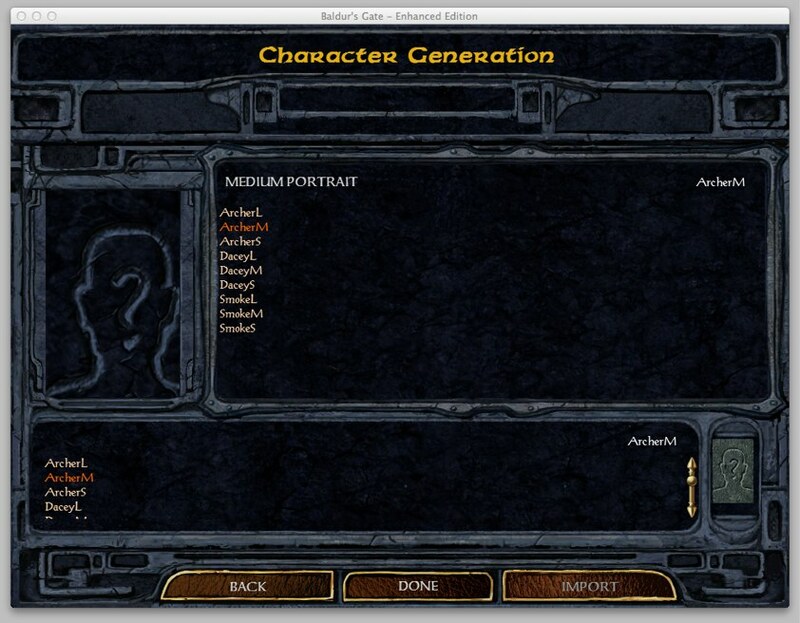 I'm having an issue using custom portraits in the OSX version. Rather than see the picture, all i see is a silhouette with a question mark. My pics are the proper sizes and .bmp, but no dice. Help? 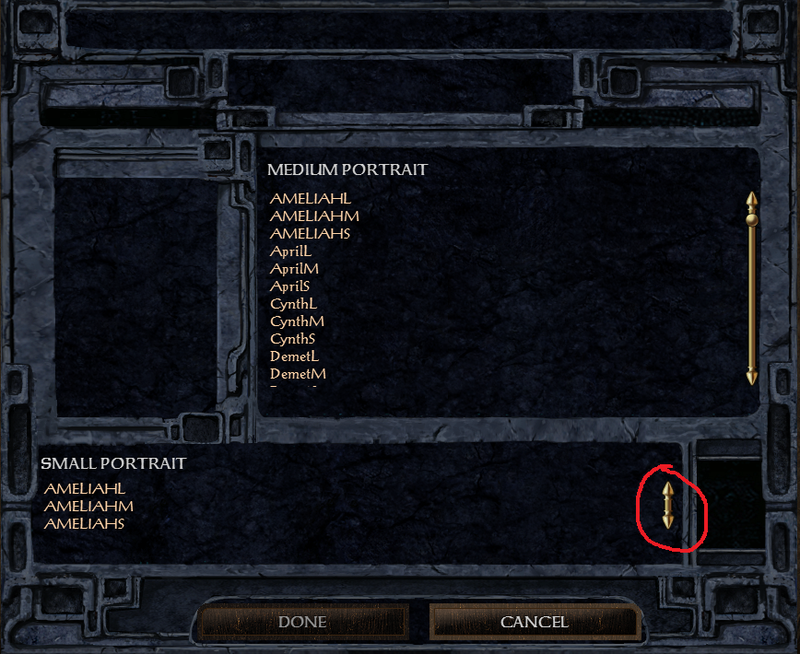 @revaar Are they the new size the EE uses or standard BG/BG2 portraits? @mlnevese they are the sizes outlined on page one of this thread (54x84 and 169x266). @revaar can you zip a set and upload to the thread? It's quite late where I am, but I'll take a look at it first thing in the morning. @revaar Long shot, but make sure you're not uploading the pictures to skype or anything, it prevents BG from reading them. @mlnevese, Here it is. Thank you so very much! @revaar, it looks like the images have been saved as 32-bit BMP, where 24-bit is required. When i change the size of the pitcures, the face of the character always disappears. How can i do with this problem? @shapiro Do you resize or crop the image? I use Paint to resize the images, by changing the attributes. @ShapiroKeatsDarkMage The simplest way to get the portrait is cropping the area you're interested in and then resizing. Aaaah. Thanks. I'll have to change that. Will the portrait then show up in my game that is already going, or will I have to start another? You may have to go into the customization screen in your character record, but you can change any PC's portrait within the game at any time. So you may have to re-select the portrait you want to use, but then it should work. Well, my portraits are showing up in the folder, but BG crashes when I click on one. Yes they are 24bit BMPs. So they are not really necessary unless you are replacing the portrait of one or more NPCs. * Notice that if you don't have it, the menu will show the medium portrait with a blank space inside the frame. you can change their portraits too but he says put it in an OVERRIDE folder but i dont see one do i need to make one? if so should it be inside the Portraits folder or some where else? @Orie, it should be in the main game directory*. You just need to name the portraits properly (DYNAHEIS, DYNAHEIM, and DYNAHEIL in this case) and put them into the override folder. * If you are using the Beamdog client, right click and select Open game location. Otherwise you'll need to find the installation directory yourself. You can also try a file search on your computer for chitin.key, the override folder should be in the same location. If it is not in the installation directory, then you will have to create a new folder there and call it that. i don't have a folder in BGEE called OVERRIDE and when i attempted to make one and place the new pictures with the new names (IMOENM) in there it didn't work and yes i have the correct measurements and i restarted the game so this still hasn't worked am i placing the folder in the wrong location? i don't have it in the portraits folder but i did try it there once to see if it mattered and that made no difference.